Yeast captured from the air and bent to the will of mankind to create bread! Serves: Potentially millions. Start fishing now and you could give Jesus a run for his money. Mix the flour and water in the bowl then cover it with the plastic wrap and leave it on the counter out of direct sunlight. Every morning your job is to grab a fork, stir the mixture and then cover it again. Within 2 days you should start to see little bubbles forming. You have now cultivated yeast. It should smell sour. 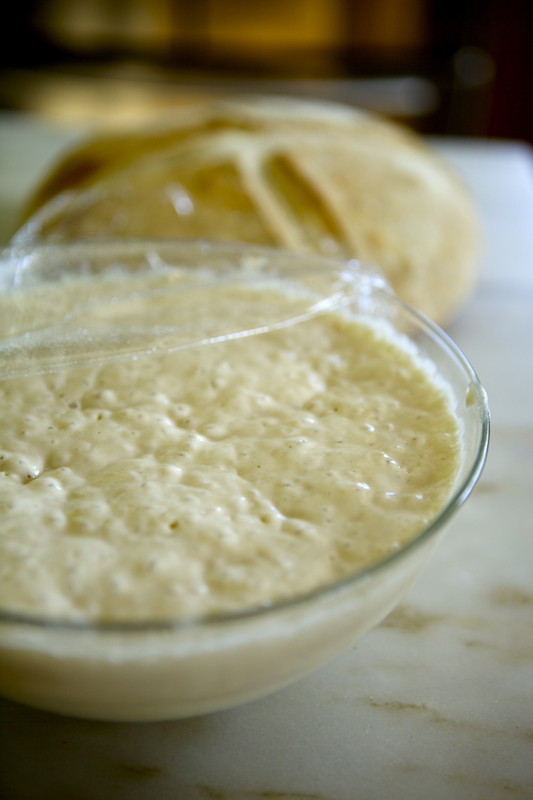 You now have a sourdough starter. And like it or not, you are now a slave to the yeast beast. Care and feeding of the yeast beast is pretty simple. You can pop it in the fridge if you are only going to make bread now and then or you can simply leave it in the same place you made it if you are going to be a habitual bread maker. If you leave it in the fridge: Remove the beast from the fridge and set it on the counter out of direct sunlight at least 24 hours before you plan to make bread. Once per month and every time you make bread (more on this in the sourdough loaf post) you will need to feed the beast by adding a half a cup of flour. If you leave it on the counter: You are committing to baking bread every week. Keep the beast covered with plastic wrap and give it a stir every morning. This is just a quick couple of swirls with a fork, not a full on whisking operation. With every recipe of bread you make you will remove a cup or so of starter and then feed the beast with a half a cup of flour and the return of a half a cup of yeast from the sponge (more on this in the sourdough loaf post). you should throw this beast away and start over. This is the easy part. Soon we’ll explore how to bend the yeast beast to your will to create the tasty loaf of bread in the background of the picture. Update (May 5, 2018): I have since started a new yeast beast. This time I have switched to whole wheat flour and used water instead of milk and the yeast seems much, much happier which is to say resilient. I feed a half cup of flour and a half cup of water every other day, sometimes every third day, and I frequently forget to stir on the in between days. I have also started moving to a new bowl every 3 months. This had nothing to do with the yeast and more to do with the fact that it gets pretty damned unsightly after a while what with all the dried flour/water/yeast sticking to the sides of the bowl. I’ve also started using glass Rubbermaid bowls that come with lids which cuts down on the mess (and waste) of using plastic wrap.